Engagement season calls for engagement photos! This was my first photoshoot of 2019! Maritza and Kevin are getting married this July at Saratoga Springs, a beautiful redwood wedding venue located in the Bay Area. 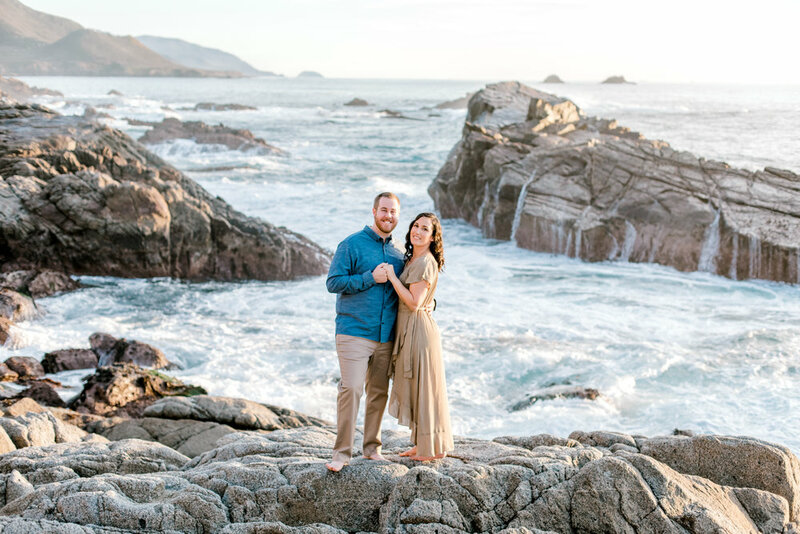 We found Monterey and Carmel to be the perfect backdrop for their engagement photos because they are all about adventure and discovery and this place has plenty for the wanderer at heart. After this shoot I learned they are an adventurous couple indeed! 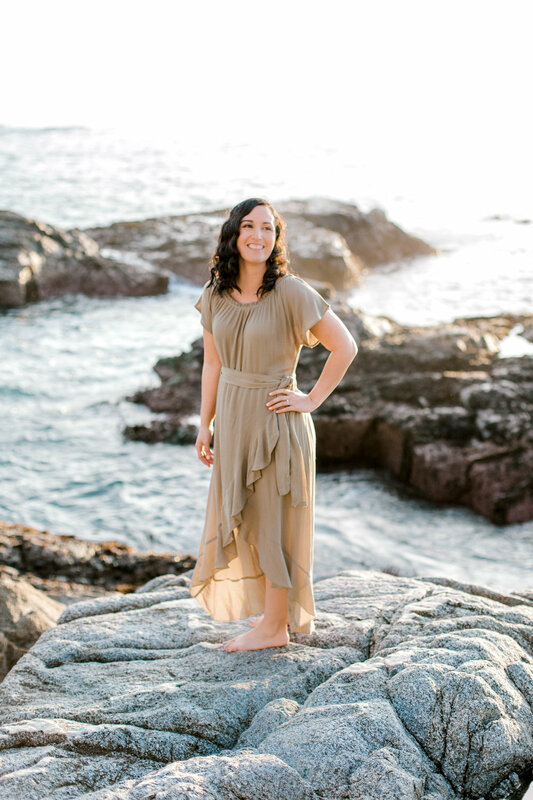 Maritza had to climb down rocks barefoot to get to this location — and let me tell you getting there was steep and these rocks are not the friendliest of textures. 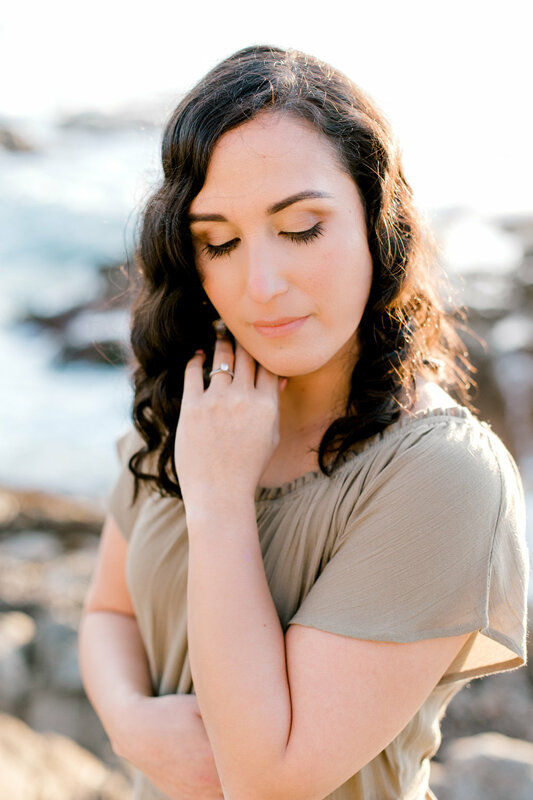 My engagement sessions include two looks and two locations. This is part 1 of their adventure, I hope you enjoy. Also, cheers to all the newly engaged couples out there. And to my 2019 bridal clients, I can't wait to capture all of your special moments this year! With engagement season underway I know there are a lot of busy brides and grooms out there! Maybe you’ve just finished doing some beautiful engagement photos for your Fall Save the Dates and you’ve just booked your venue for this time next year. Now you need to get your invites out to your loved ones! Look no further than Basic Invite. Basic Invite combines beautifully illustrated wedding invitations with free wedding website services so you can keep your wedding theme trendy and keep your guest list tracking organized and streamlined. I love Basic Invite because they offer so many styles and trends that I have never seen with other invitation companies. We photographers love photographing your invitation suite placed nicely alongside all of your other wedding day details, and Basic Invite helps us execute this beautifully! Basic invite is a full-service wedding invitation company that offers over 40 different colors of envelopes to choose from! I love that they are trendy and fun and have countless color options available to match any hue or color tone. So whether you are planning a spring, summer, winter or fall wedding, you can make sure your invites are in perfect alignment with your wedding day colors, style and theme! And for anyone loving the current glowing golden and deep maroon colors of the season they have a beautiful new Fall Save the Date line, now available! As a photographer I absolutely LOVE capturing fall weddings. There is something about the golden hues mixed with the warm burgundies, wood textures and jewel tones that are timeless and Basic Invite’s Fall line will align perfectly with the season. Their free address collection and mailing service is also an awesome feature. In three simple steps your guests can click a link, enter in their postal information and you will receive an envelope with their address printed and ready to send out, for free! Collecting your RSVP’s is easy for everyone. The wedding invite includes a tear off RSVP card in over 30 styles (including a foil option which is my all-time favorite). Guests addresses are printed on the back of each seal and send so there is no envelope necessary. Just add postage. Easy peasy. They also offer free customizable wedding websites for sharing day of details with your guests. They offer over 900 options for consistently themed paper sets that include invites, save the dates, menu cards, wedding enclosure cards and even thank you cards! Try Basic Invite out for free. They are one of the few Invite companies that allow customers to order a sample of their invitation to preview the quality of paper and print, before you make your final purchase! You can find Basic Invite on Facebook, Instagram, Twitter, and Pinterest. Have fun and happy Fall y’all! I had the honor of teaming up with this RAD new children’s + baby boutique located at the Del Monte Shopping Center in Monterey called MONOKROME For the Modern Baby. MONOKROME is the first black and white children's boutique in the US curated from small business Instagram and Etsy shops not currently sold in the US market. With their Black and White dominated color scheme theme, their store owner, Janell Green sources the most stylish outfits and trends from size newborn to 9 years old. I helped Janell along with the Monterey community and their adorable kiddos to celebrate the store's grand opening Thursday May 17th. Each customer who purchased an item got to get in front of my lens and we also raffled off $150 towards an in home lifestyle family photography session with yours truly, Lacey Michelle Photography! So happy to support this local business and meet some awesome new mama friends in the Monterey area!